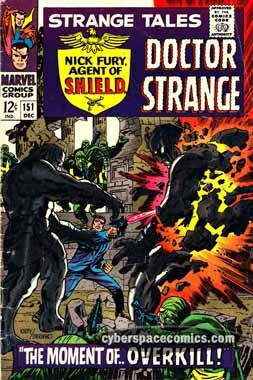 Jim Steranko‘s unique art style made him one of the first comic book super-star artists. Over four decades ago, he created covers for Captain America and Nick Fury that are still paid homage to by today’s artists. His first comic art was published in September 1966 and two months later, his first Marvel work was published in Strange Tales #151. Not only did he provided the cover alongside Jack Kirby but, he also worked on the interior art of the Nick Fury story, as well. A few short months later and Jim Steranko was drawing and writing the Nick Fury feature. Not too bad for his first year in comics.